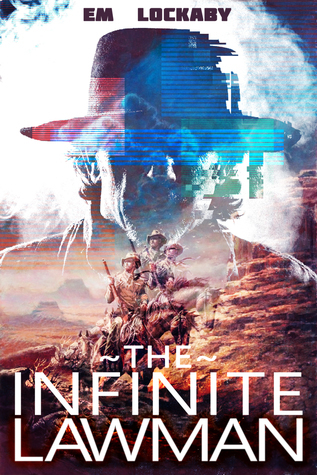 I do have to admit that the cross-genre Cyberpunk/Western novel, The Infinite Lawman was an interesting idea. I hadn’t seen these two genres combined before, so the combination certainly had an original feel to it, at least initially. There were certainly a few moments where some of its sources showed themselves, but the strength and pace of the story helped to alleviate these concerns. Although, if this is the first book in a series, I’m not entirely sure where it can go from here. Before I get any further into my review, I did find it odd that the margins were so enormous on this book. The page numbers were also all on the same side of each page (in the gutter for the left-hand pages), and the font was quite small (so as to fit in the small space provided by the enormous margins). I can only assume that this was a proof copy of this book and the author fixed these issues before finally publishing this novel. Now, as for the plot, up until the end of the second act, I felt it closely resembled the plot of True Grit (1969/2010). And yet, the end of the book had a distinctly more Tron: Legacy (2010) tone to it. Bravo to the author who was able to deftly combine these two, somewhat different plots together. While the base concept felt much like The Matrix (1999), there were many questions that the digital world of The Cog brought to my attention but were never satisfactorily answered by the conclusion of the book. Maybe the follow-on books in the series will go into more details, but I almost think this book would have been better covering the heyday of the speedrunners. That sounded like an interesting bit of action. A well-written piece of cross-genre fiction, I give The Infinite Lawman 4.0 stars out of 5.